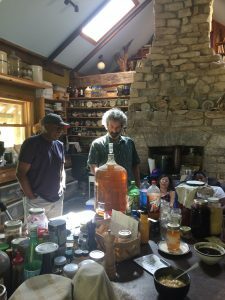 Back in April I traveled to Walnut Ridge, Tennessee to participate in a Fermentation Residency Program taught by the well-known fermentation expert; Sandor Ellix Katz. It was a great experience at a wonderful venue with an amazing group of fellow fermenters. The program is offered twice each year and there is huge demand for the opportunity to study at the school. I submitted an application to attend the spring residency back in January and was excited when in February I received notice that I had been accepted into the program. 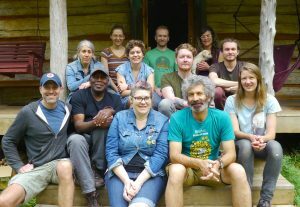 The fermentation school is based at Sandor’s residence; a cozy cabin with all the comforts of home and a wonderful gourmet kitchen containing modern features despite it being off the grid, solar-powered, and situated in a rather remote and isolated location. Totally surrounded by mountains, forests, and beautiful landscapes. Sandor opened the doors to his home wide for us and we couldn’t have been made to feel any more welcomed during our stay. 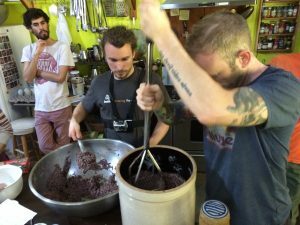 A dozen participants took part in this fermentation workshop and traveled from points as close as nearby Nashville, and as distant as the country of Argentina. The cast of attendees included a couple of professional chefs, a farmer from Texas, a number of fermentation business owners, and a few everyday foodies who just enjoy crafting their own tasty and healthful fermented products. This particular residency program was unique in a couple of respects; first of all it was recorded by filmmaker M. Sean Kaminsky who is creating a new documentary about fermentation. Sean is also the producer of Open Sesame – The Story of Seeds which was released in 2014. In addition to filming the proceedings, Sean also conducted interviews with Sandor and many of the residency participants. 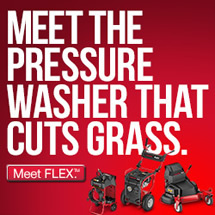 Another interesting aspect of this residency is the involvement of Dr. Rob Knight and the researchers from the University of California at San Diego who will be compiling microbiome samples of our skin, mouth, and gut bacteria taken before, during, and after the program to be analyzed through the American Gut Project. We took samples of the various ferments we prepared throughout the week to be analyzed as well; with a goal of determining the impact that making and eating fermented foods has on the body. So what’s the Big Deal over Fermented Foods Anyway? 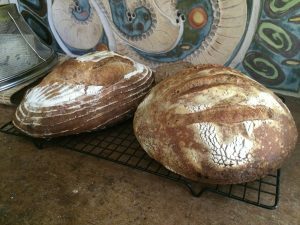 Fermentation is a mystery to many people in spite of the history that it holds in most cultures; and the dependence that we had on ferments and “cultured foods” before the days of refrigeration. We also don’t realize that fermentation is an essential part of the processing of many common foods; butter, teas, ketchup, chocolate, salami, yogurt, vinegar, sauerkraut, breads, and naturally cultured foods were all traditionally created through the workings of fermentation! 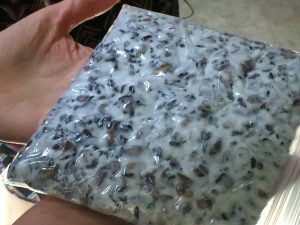 So what was once considered survival food for storing and preserving food to eat over winter or during long voyages, is now being touted as survival food in terms of the nutrition and healthful properties that they have to offer. In light of an overuse of prescription antibiotics, outbreaks of C. diff and other gut infections, and the realization that most bacteria are beneficial, many people are turning to fermented food products to address potential deficiencies in these essential organisms. We certainly did our share of making and eating fermented foods during the stay at Walnut Ridge. Sandor Katz is an excellent teacher who is on a mission to inspire others to explore the world of fermented foods. He has a talent for simplifying the processes of fermenting foods and instills confidence within his students to venture off afterward to experiment and ferment their own products. Part of that simplification is the result of Sandor’s old-school flavor that shuns the use of gadgets and technology in favor of basic tools like crocks and jars to forge his craft. That means that his students can leave the residence program, return home, and jump right into creating their own ferments quickly and easily. 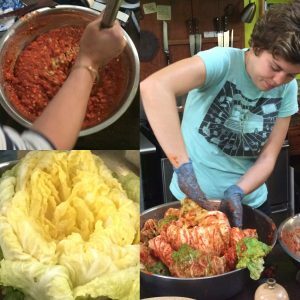 Many students have left the program and turned their experiences directly into businesses catering to unique fermented food products. The residency program isn’t designed for beginners and it skipped right over the basics of fermenting to cover more advanced concepts and techniques. In spite of that everything was easy to grasp and the instruction was comfortable to follow along with. 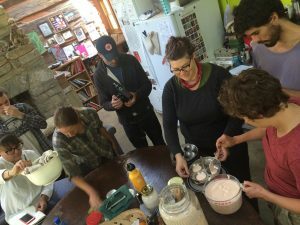 Our days started out with breakfast, which like every meal was improvised and a collaborative effort that always included fermented creations such as sourdough hotcakes, cereals, veggies, and assorted krauts. After breakfast we moved right into our fermentation lessons, with the days divided into specific subject areas such as; grains and breads, various vegetable ferments, tempeh production, making miso, kefirs, fermented beverages, etc. Frequently we would start on one project and then move on to another, only to return and pick up on a previous project when it was ready for the next stage. There was a nice flow that allowed us to track the progress of our ferments from start to finish throughout the term of the residency. We had breaks for lunch and dinner which were always a mix of planned dishes incorporating the ferments that we produced along with spontaneous creations that were more spur of the moment and the result of our culinary imaginations! The food was so good and of course a great proportion of it was the result of the fermentation processes that we were studying. Everyone worked together and even the meal prep turned out to be part of the lessons of the program. My favorite foods during the week were the simple flat breads, Sandor’s whole fermented daikon radishes, and the tempeh that we made. The professionals in our group also shared their expertise and skills; first there was Trevor a local Nashville chef, and Sarah who owns two Nashville restaurants. Then a number of talented fermenters who shared their knowledge and even brought along samples to share with the class; Cheryl who runs a fermentation CSA in NYC, Manu, a beverage fermenter from Argentina, Loren who sells krauts and kombucha in Mississippi, Jeanne who offered up some great water kefirs, and Manda who markets an impressive line of unique “fermental” and herbal products in Denver, Colorado. Let me close by attempting to list all of the ferments and processes that we studied and worked with during the week such as: Kvass, breads, ginger bugs, koji, amazake, dosas, Idli, yogurt, kefirs, butter, injera, nuka pots, doogh, tempeh, natto, kim chi, miso, vinegars, a gluten free buckwheat bread, gundruk, other fermented beverages, and takuan. I don’t advocate the use of fermented alcoholic beverages, and personally don’t include dairy in my diet but there were plenty of other ferments for me to take advantage of. It was all exciting and even the basic sauerkrauts and veggies took on new twists and techniques as we learned variations in styles and preparations. 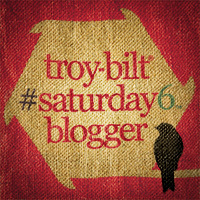 There were also field trips, foraging opportunities, a journey into Sandor’s fermentation cellar, visits from friendly neighbors, the formation of the “Bacteria Band” made up of stringed instruments, horns, and vocalists, lots of laughter, campfires, beautiful days, cool nights, great conversations, and so much more that I could write about! It was a great experience and I think everyone learned a lot and left anxious to get home and try some new ferments on their own. I have a few things bubbling away right now including Jun, bread doughs, and some krauts. At the top of my to-do list are some new vegetable ferments and condiments, and I really can’t wait to prepare a batch of homemade tempeh! 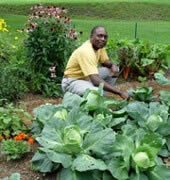 If you’ve never tried it, fermentation is simple, easy, safe, and a great skill to add to any gardener’s knowledge base.